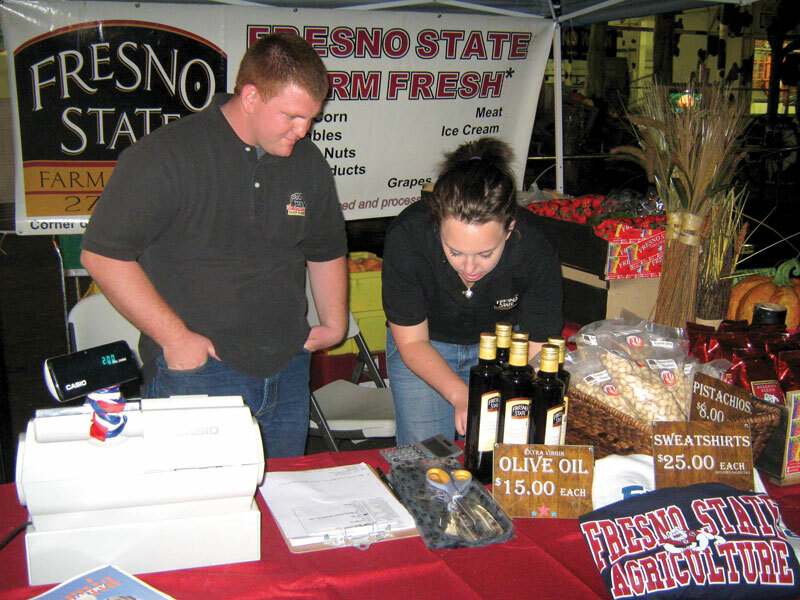 The Big Fresno Fair and the Fresno State Rue and Gwen Gibson Farm Market have joined forces to create one new and permanent attraction at the fair this year—The Farmer’s Market. The Farmer’s Market will include fresh produce, grown on the Fresno State campus, and single-servings of ice cream made by Fresno State students. It will be sold by the students who work at the Gibson Farm Market on campus. 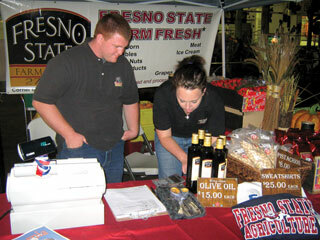 “It makes sense to have the Gibson Farm Market involved with our newest attraction, the Big Fresno Fair Farmer’s Market, which is all about promoting the commodities grown in Fresno County,” said Stacy Rianda, Deputy Manager II of the Fresno Fair. The Farmer’s Market is surrounded by a display of 20-foot corn stalks, tomato plants, a huge walnut tree with various tree fruits depicted on it, bee boxes and grape vines. “It’s also a great way to help us bring Fresno State to the forefront and help be a part of the centennial celebration,” Rianda said. Jennifer Sobieralski, manager of the Gibson Farm Market, is directly involved with the Farmer’s Market at the fair. “We have organic produce and it’s sold at a flat rate,” Sobieralski said. The flat rate for the produce and a water station near the market to wash the produce make it easier for families to buy produce and enjoy it while they’re still at the Fresno Fair. Fresno State’s Centennial Project Coordinator Tracy Newel is working with the Fresno Fair to promote Fresno State and its centennial celebration while tying it into the agriculture industry of Fresno County. The Farmer’s Market is located north of the livestock barns, across from the wine garden. If you’re looking to grab some pistachios or ice cream quick, a Gibson Farm Market stand is stationed next to it. “This should be a great reminder for the community, what a force for agriculture education we have had in our community for the last century,” Newel said. Guests have until this Sunday, Oct. 17 to enjoy this and the many other Fresno State related attractions at the Fresno Fair.